Vibrant in its myriad offerings. Resplendent in is Glorious traditions. Home of choice of the discerning business traveler. Newly set up Usha Kiran Place. Hotel & Towers is the preferred destination of corporate travelers, accustomed to its innovative style of service and delicious cuisine. Centrally located, it is just minutes away from the Railway Station, Airport, Bus Stand, Prime business, Shopping Arcades and most important THE TAJ. Services include travel desk currency exchange, safe deposit tockers and Doctor on call, Hi Fi Communication facilities among a host of others. Centrally Located: 2.5 km from Railway Station & the Airport, 1.5 km from Bus Stand. 1 KM, From Sadar Cantonment Shopping Area, 3 km from the Taj and 2.5 Kms. 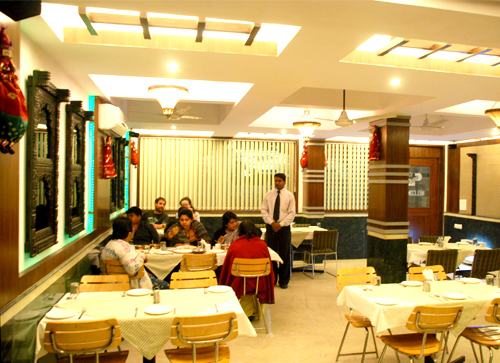 from Sanjay Place "The Commercial Hub of the City" DINING: Rasoi-The Open hearth restaurant serves the Indian. Chinese and Continental food. ROOM & SERVICES: All The rooms are equipped with Internet Facility and mini bar. The same is available in the Hotel Lobby also. Pick up and drop facility to the Airport & Railway Station. Travel Services and currency exchange also available. Currency Exchange, Doctor on Call, Parking, Travel Counter, Laundry Facilities, Security Guard, Breakfast Services, Room Service, Airport Transportation, Backup Generator. DVD Player, Toothbrush/Razor on Request, Wakeup Calls, H/C Water, Air Conditioning Room, Attached Bathroom, Iron/Ironing Board, Cable/Satellite TV, House Keeping. User reviews for "Usha Kiran Palace Hotel Agra"